Luxurious and sleek with its chrome embellishment and graceful contours, the limited edition Jaguar Strat will make jaws drop when it turns up in the spotlight. The streamlined alder Strat body is adorned with chrome control plates and a tortoise shell Jaguar pickguard, adding a blaze of style that’s for the bold. Sounding as killer as it looks, this instrument has everything that made you fall in love with both guitars. Fender didn’t just take visual cues from the Jaguar; they took its agile switching system and melded it with Strat electronics to create a uniquely powerful hybrid system. The traditional 5-way switch is joined by a dedicated thumbwheel tone control for the bridge pickup while dual upper bout switches allow position 3 to select either the middle pickup alone, or all 3 pickups at once for a powerful blast of tone. The matched set of vintage-style single-coil Jaguar pickups are as period-correct as possible and have the authentic sound of the ‘60s. The 25.5”-scale maple Jaguar neck sports a “Deep C” profile, along with a 9.5”-radius rosewood fingerboard and 22 medium jumbo frets for enhanced playability, along with a bone nut. Other elegant touches include a locking tremolo with screw-in arm, polished chromeplated Mustang bridge saddles, Jaguar knobs, deluxe locking all-short-post tuning machines and “Limited Edition” neck plate. 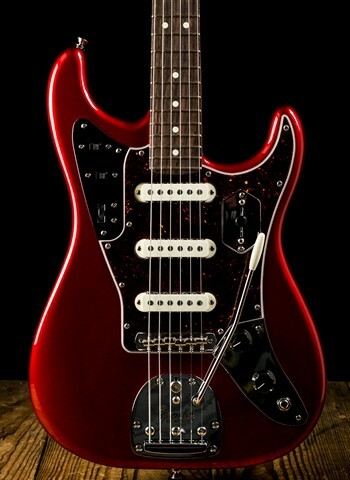 An arresting guitar with graceful contours, the Jaguar Strat was born to do one thing - make the scene in style. Includes a hardshell case and Certificate of Authenticity. Special Electronics: 2-position slide switch to engage(Down)/disengage(Up) secondary switching option when in position 3 (Middle) of the 5-way pickup selector. 2nd 2-position switch, Up for Neck and Bridge pickupsonly, Down for all three pickups on. Thumb-wheel control for bridge pickup tone.